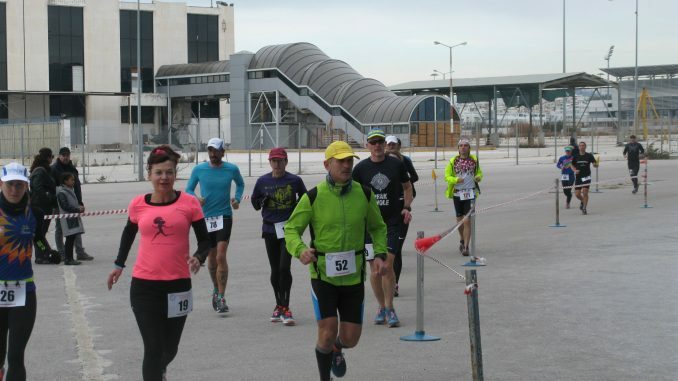 The Athens International Ultramarathon Festival 2019 drew to a close today with the culmination of the 1000 mile, 1000 km and the 6 day race. Weather conditions were not great this year with wind and rain but two finishers in the 1000 mile race with Pavel Zuk (POL) finishing in 14:20:00:14. Second was Nikolae Buceanu (ROM) in 15:19:46:36. In the 1000 km race Petri Pertilla (FIN) finished in 9:21:10:29. There was a fairly close finish in the 6 day with Zdravko Baric (BIH) winning with 366.61 miles ahead of Sharon Gayter (GBR) on 360.40 miles (580 km) who set a new British FV55 record by over 55km. (Sorry about mixing distances). Third was Jaques Morel (FRA) who covered 356.05 miles. Full results (in miles and Km) can be found at the link below. Race Director Costas Baxevanis announced a new event to take place in mid-October 2019, the 1st Multidays Festival, Athens, Hellinikon consisting of 1000, 2000, 3000, 4000 and 5000 km races. Further details will be announced on the race website at the link below.